Whenever you send professional email messages, it's really important to make sure the message is perfect. You don't want to blow an opportunity by making any mistakes - either in how you send emails or how you keep track of them. Read on to learn how to write and send top-notch professional email messages. Why would you want to send a professional email? There are a number of reasons. You might send your cover letter to a potential employer, a thank you letter to a colleague who agreed to be a reference, a resignation letter to your current boss, or a request for a letter of recommendation. You may have other reasons for sending non-personal emails, and in fact, it’s a good idea to make sure all your email is organized and professional. 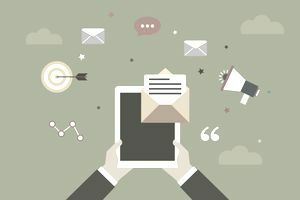 Here's what to include in your messages, what not to include, and how to close, sign and send your email messages. Subject Line: The subject line should concisely convey your purpose for writing. Your subject line can be as simple as "Thank You" or "Request for Recommendation." Greeting: Even if you are writing a very short email, include a greeting. If you know the name of the person, include it. Unless you are on a first-name basis with the person, call them by their title. Length: Keep your email as concise as possible. People tend to skim long emails, so only include essential information. Font Style: Avoid ornate, playful, or colored fonts; these simply distract the recipient from your actual message. Avoid overusing bold and italics as well, which make an email look cluttered. Do not write in all capital letters either; this comes across as angry or overexcited in an email. Emoticons: Do not include emoticons in a professional email; save these for personal correspondence. Spelling and Grammar: Just because you are writing an email does not mean you should be sloppy about spelling and grammar. Edit your email carefully before sending it. An error-free message tells the recipient that your email should be taken seriously. Closing: Sign off with a brief "Thank you," "Best," or another simple send-off, and then your name. Most email accounts let you embed a signature with your name, title, and contact information into every email. It is a terrific way to make each correspondence more professional. Make Sure Your Message is Complete: Double check to make sure the Subject line of your email is filled in, you have included a signature, you are sending the message to the right contact person, and you have filled in the Bcc field to send a copy to yourself, so you have a record of the email message. Proof Your Email Message: Before you hit send, also make sure you spell check and check your grammar and capitalization. They are just as important in email job search correspondence as they are in a paper letter. Send a Test Email Message: Before you actually send your email, send the message to yourself first to check that the formatting works and that nothing looks out of place. If everything looks good, go ahead and send the email to the company or individual you’re contacting. Send a Copy of the Email Message to Yourself: Use the Bcc field to send a copy of the email message to yourself, so you have a record of when you sent the message and who you sent it to. You can also find this information in your sent folder. File Your Copies: With many email programs you can set up folders to make it easier to find any important past emails. Set up a folder for all your job search emails and file your copies of the email message you send in your job search folder. Time is of the essence when you're job searching, so it's important to check your email regularly and frequently, so you don't miss out on any important opportunities. At the very least, check your email in the morning, and during the early afternoon, so you'll have time to respond promptly to the messages you receive. These days, having a smartphone can make it easy to check your emails wherever you go and whenever you want – no more hovering over your computer. In fact, you can get notifications for new email messages, so you can read them as soon as they hit your inbox.